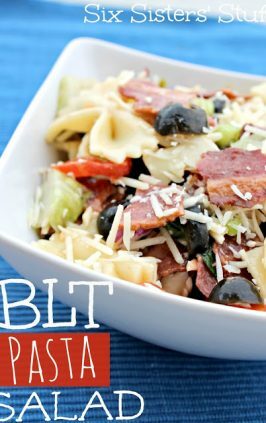 This is The BEST Homemade Pasta Salad and it is always a hit at parties, potlucks and barbecues. This easy pasta salad is made with rotini pasta, cucumber, tomato, olives, pepperoni, cheese, green bell pepper, red bell pepper, red onion, cheese and Italian dressing for plenty of flavor! 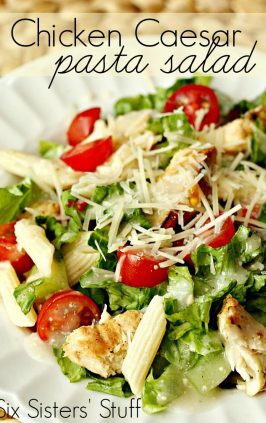 What is the best dressing for pasta salad? 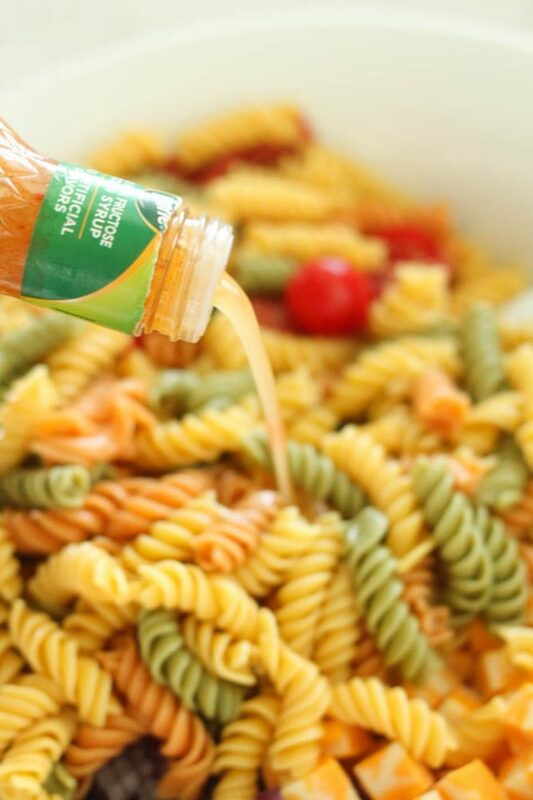 We love using Italian dressing for pasta salad. 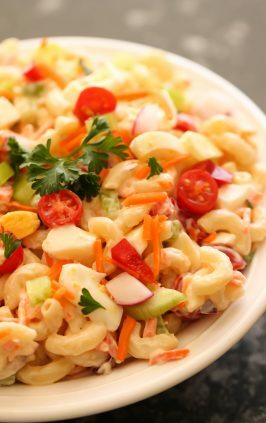 You can use whatever Italian dressing your family prefers, but our absolute favorite dressing for pasta salad is Kraft Robusto Italian Dressing. 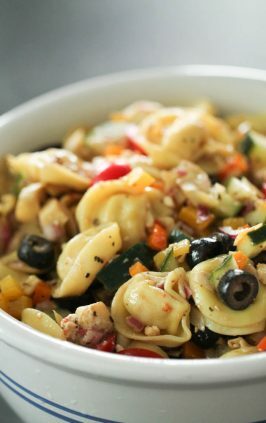 First things first, when it comes to making pasta salad you want to cook your pasta so it is cool when you mix in all the other ingredients. 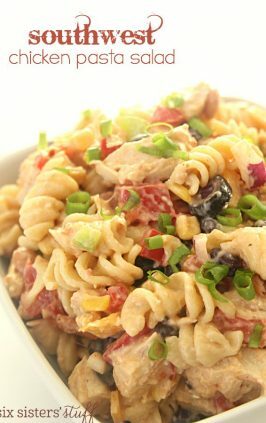 Pasta salad is only as good as the pasta you are using to make it! 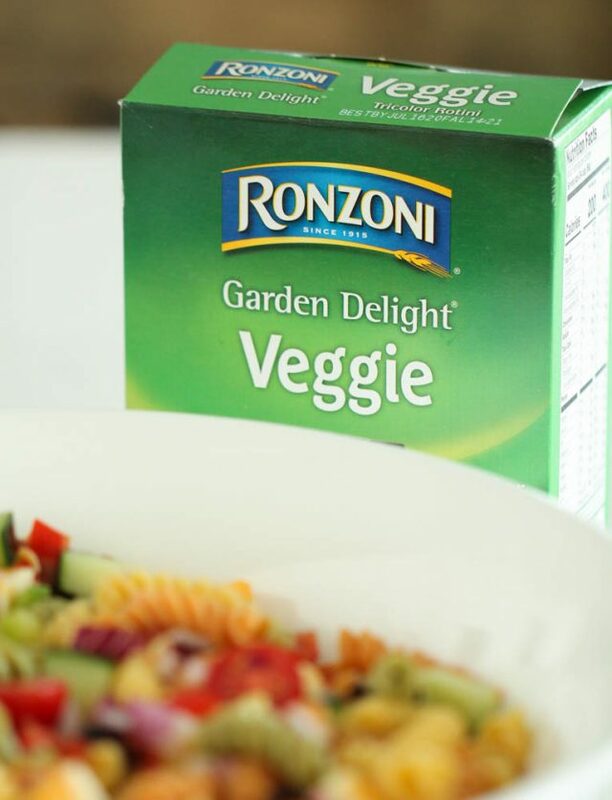 I love using Ronzoni® pasta in my recipes because it is non-GMO and is so delicious. 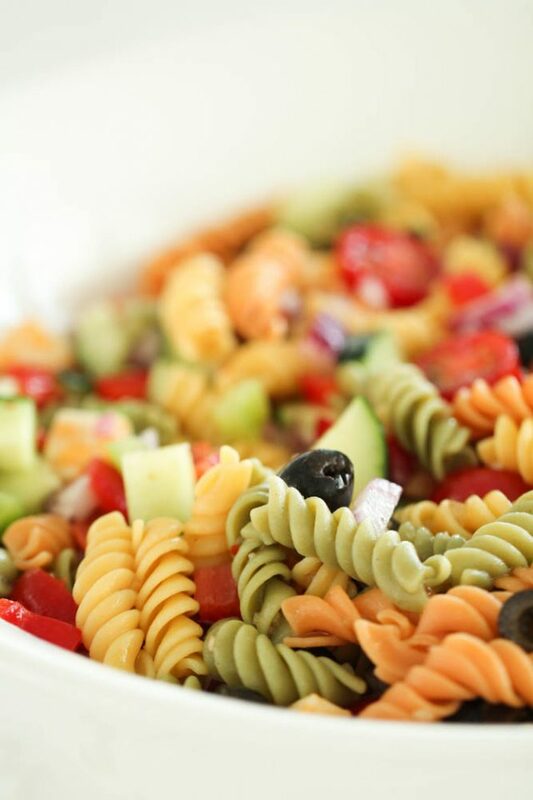 For this pasta salad recipe, I used Ronzoni Garden Delight® because I love the beautiful colors of the pasta when it is tossed together with all the vegetables. 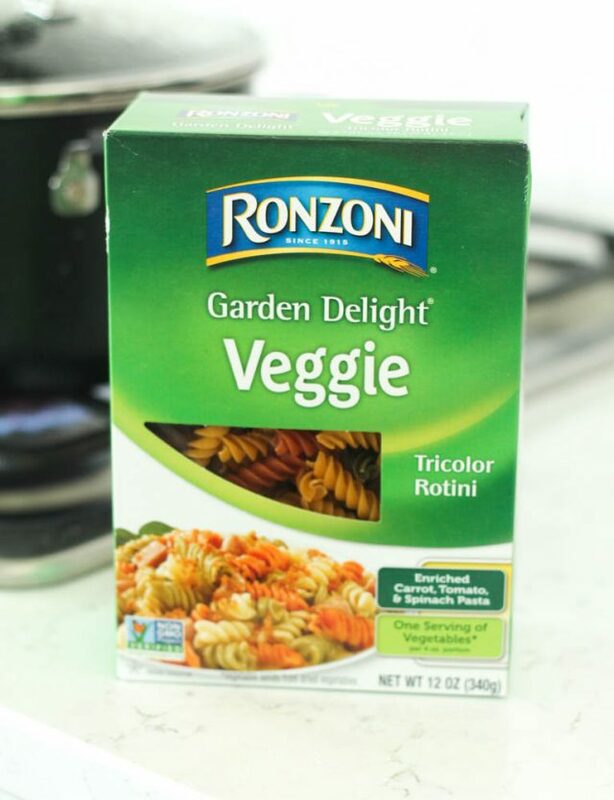 I also love that just 4 ounces of Ronzoni Garden Delight® has a serving of vegetables! 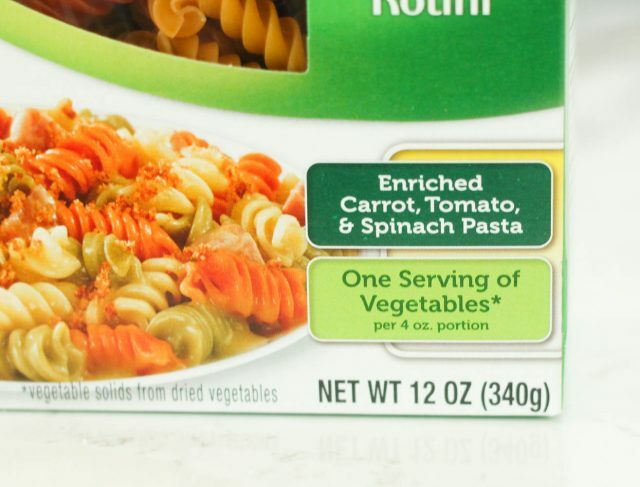 This pasta is enriched with dried carrot, tomato and spinach and tastes so amazing that my kids didn’t even realize they were eating extra veggies. While my pasta was cooking, I chopped up all the other ingredients going in my homemade pasta salad. I added pepperoni, cucumber, cherry tomatoes, red bell pepper, green bell pepper, red onion, sliced olives and Colby Jack cheese. I drained and rinsed my pasta after it was done cooking. If you rinse your pasta with cold water it will wash away extra starches so your pasta doesn’t stick and it cools it down so you can toss it in with the other ingredients. You don’t want to melt that cheese with warm noodles! 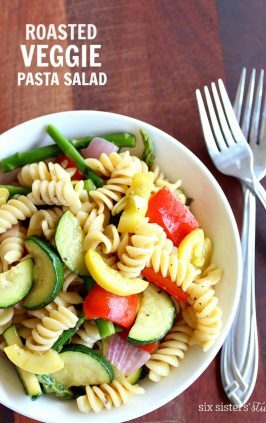 Once your pasta is rinsed and cool, toss it with the prepped vegetables in a large mixing bowl and pour Italian dressing on top. 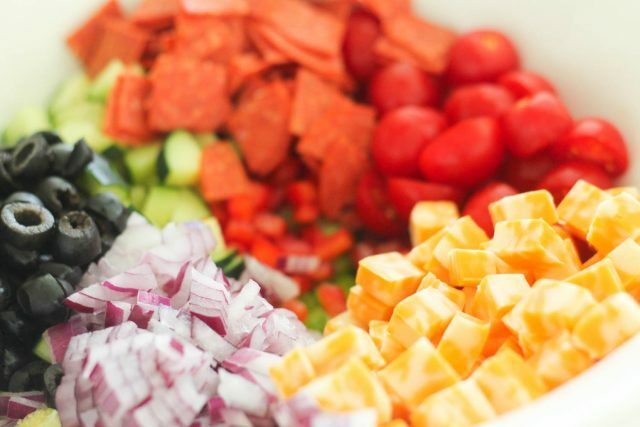 Toss until all the pasta salad ingredients are evenly coated in dressing. 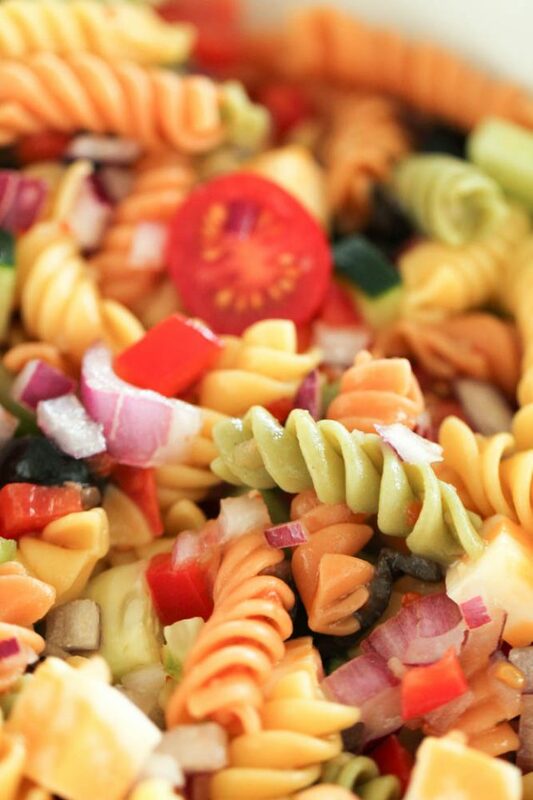 Refrigerate pasta salad until it is time to serve. 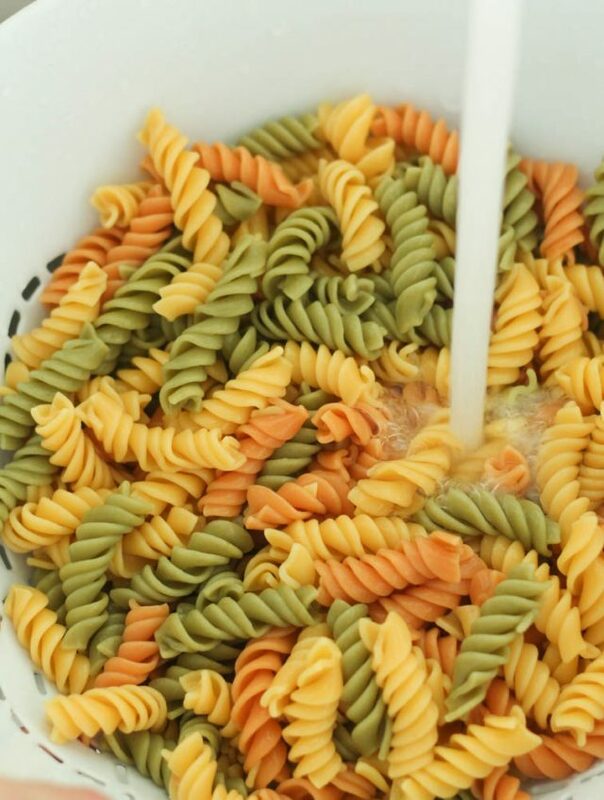 I like to make my pasta salad earlier in the day so the pasta has time to soak up all the delicious flavors! 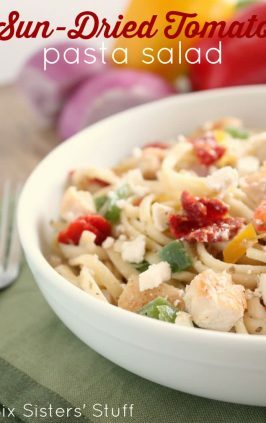 Be sure to check out all the different types of pasta Ronzoni® has to offer! My family especially loves the Ronzoni® Smart Taste® pasta (for extra fiber) and the Ronzoni® Healthy Harvest® pasta (made with 100% whole wheat). This pasta salad is perfect for parties, barbecues and potlucks! It is easy to make and tastes delicious. Drain pasta and rinse in cold water. Toss cold pasta with remaining ingredients until well combined. 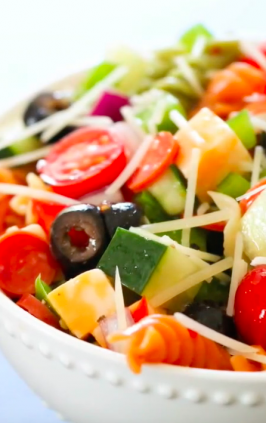 Watch the video below to see how to make our Barbecue Pasta Salad. It is always a crowd favorite! I just made this and oh my gosh it is awesome! So yummy!! 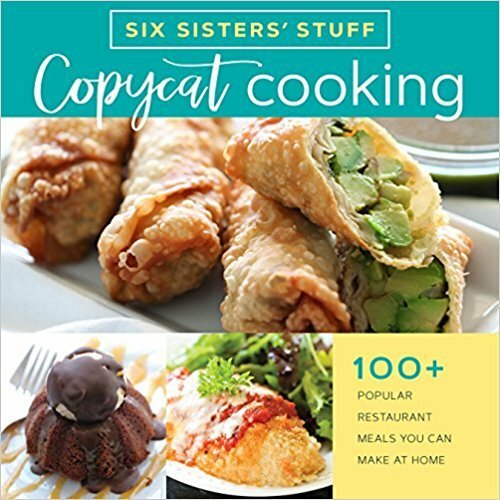 can this be done in slow cooker ? This cannot be done in a slow cooker. It is a cold pasta salad. I just found this recipe and plan to make it this weekend (need to get to the market for fresh produce!). The only thing different I would do is pour a little ranch dressing with the italian! We all love both dressings, so I thought mixing them together might make it even better - if that's possible - right?!?! Thanks for sharing! That sounds really good! We'll have to give that a try! Thanks so much! Good recipe! I've tweaked it a little and added McCormick's Salad Supreme dry seasoning, chopped pepperoni, and sliced pepperoncinis.